Fuzzy grey 1/4 zip pullover by Top of the World with the UW Oshkosh wordmark on the left chest in grey. Grey 1/4 zip women's pullover by Top of the World with the UW Oshkosh wordmark on the left chest in pink. Pink zipper and pocket accents. Fuzzy oatmeal 1/4 zip pullover by Top of the World with "UWO" on the left chest in black and gold. Gold women's 1/4 zip long sleeve shirt by Under Armour with the UW Oshkosh wordmark in grey on the left chest. Fuzzy grey full zip by Top of the World with "UW Oshkosh" on the left chest in black and gold. Black 1/4 zip by Badger Sportswear with "UWO Titans 1871" on the left chest in white and gold. Two-tone grey 1/4 zip pullover by Under Armour with the Titans logo on the left chest in white. 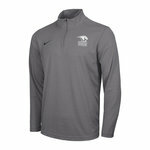 Grey 1/2 zip pullover by Nike with "UW Oshkosh Titans" on the left chest in white. Grey 1/4 zip long sleeve shirt by Nike with the Titans logo in white on the left chest. Grey women's 1/4 zip by Camp David with "UWO" on the left chest in black.